Crate training a dog taps into a dog’s instincts as a den animal. 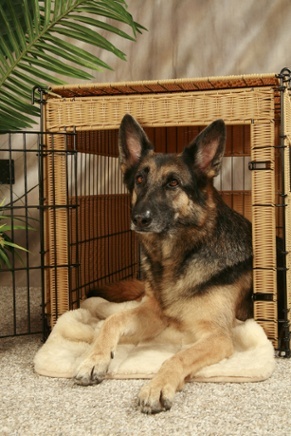 The notion is that the crate becomes your dog’s “den” and allows him to have a place to take refuge, relax, and sleep. Due to this “den” effect, crates can be used effectively to assist in house breaking as well. A dog inherently won’t usually want to soil, or eliminate, where they sleep. Typically, dogs relieve themselves out on the perimeter of their living areas. Being enclosed in a crate provides the motivation for most dogs to “hold it” until let out to relieve themselves further away from the sleeping area. Crates provide a great benefit for us too. Crates are great baby sitters. They allow us to prevent a dog from getting counter-examples to household rules by coming up with rules and rituals on their own. They allow us to get some things done around the house when we can’t be in “semi-training” mode with a newer or less trained dog. 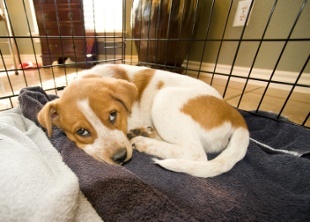 Your dog’s crate should be just large enough for him or her to turn in a circle and lie down. If your dog is young and you think they’ll get bigger, choose a crate that will work when he or she reaches full adult size. You can section off excess crate space, when your pup is younger, by using a large box covered in a towel, placed in the back of the crate, so your pup can’t eliminate at one end of the crate and sleep in the other end. Puppies under four or five months of age shouldn’t stay in a crate for more than three or four hours at a time during a day. Being in a crate for 6-7 hours overnight, while sleeping, is usually fine after a pup reaches about 10 – 12 weeks. Younger puppies sometimes can’t control their bladders and bowels as well as older pups and adult dogs. The same goes for adult dogs that are being house-trained. Physically, they can “hold it”, but they may not have built up a habit to think they have to “hold it” for that long. After you’ve achieved proficiency in the house breaking skill, if you feel you need to “enclose” a dog for hours at a time, then a dog run or large kennel is a more appropriate “baby sitter” than a crate. Ideally, crate training should follow the same “natural learning process” that I advocate when teaching your dog anything. That is, start everything as easy as you can and then incrementally adapt to progressive challenge. Many of us think of teaching our dog “sit” or “down” in progressive stages. We think of doing many training sessions over several days or a couple of weeks to increase our dog”s proficiency when learning classic obedience commands. Fewer of us though, think of crate behavior in the same way. We often just simply put our dog in one if we absolutely have to. Instead, I”d suggested thinking of the crate training process more like teaching a dog to do a “sit” or a “down”. Start out easy, expect that it”s going to take a few days to build proficiency and be methodical in your approach. QUICK TIP: If you haven’t decided on a puppy or breeder yet, ask the breeder if they begin the exposure to crates with their puppies. A couple of weeks of exposure to a crate while pup is still with the breeder can go a long way to helping your crate training process once your puppy is with you. Feed your dog in the crate: Begin placing your dog’s food bowl in the crate. Let them eat every meal leaning into their crate. Gradually, place the food bowl further and further towards the back of the crate. Make a new crate your dog’s new bed: Place the crate in the area where your dog may eventually have a dog bed. Place a blanket or properly sized bed inside the crate. 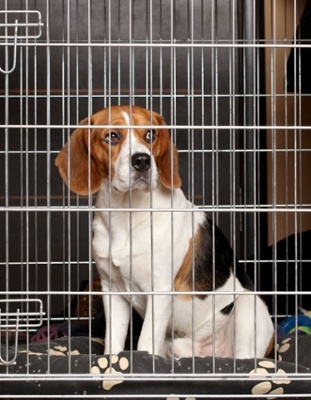 Take the door off and allow your dog to use the crate as they want to. Spend time bonding with and petting your dog while they’re in the crate. Make sure the crate door is open and secured so that it won”t startle him in his first few crate experiences. Many crates allow you to just remove the door. Alternatively, you can get a small bungee cord and bungee the door open so it doesn’t rattle and inadvertently close. Make being in the crate special: Save a special toy with some peanut butter, or other treat, exclusively for when your dog decides to lie down in their crate. When they do, place the toy in the crate with them. Begin closing the door for a minute or two at a time. While your dog eats a meal or chews on the special toy that they get only for crate time, gradually have them do these activities while the crate door is closed. Keep in mind that this should be for just a few minutes at a time at first. Gradually, increase the time that your dog stays in the crate with the door closed. If your dog protests being in the crate, ignore them. Once they settle themselves, even for a moment, immediately let them out. The idea is to make them think that settling and recovery behavior gets them out of the crate. Incrementally, increase their time spent in the crate in random intervals throughout the day. Be sure to have small bouts of crate time throughout the day even when you’re in the house. Also, begin leaving the room for short periods and even leaving the house during a crate training session for a few minutes. This allows you to practice the “returning home” ritual. As I’ve said in other articles, one of the core skills we can teach a dog is to “recover from stimuli” when their environment changes. This behavioral training exercise is a great case in point of teaching a dog to do just that. The “returning home ritual” involves ignoring your dog’s excitement (that means ignore your dog) when you first get home. Act as if you don’t have a dog if they are overly animated and excited. The first time you acknowledge them, after you get home, is when they settle themselves. Even then, this attention will only be for a few moments as your attention may elicit over-excitement again. If your dog gets over excited the moment you pay attention to them, immediately ignore them again. Play this alternating “attention/ignoring game” until your dog can handle longer bouts of attention when you get home. When you’re introducing this idea in crate training, the idea is to coach your dog that they get attention and get let out of the crate when they settle down (not when they freak out). So, realize that this may take quite a while in the first few trials of this exercise. Be diligent and be patient over these first couple of days. Consistency and exactness will pay off for years to come with your new dog. It’s well worth the several days of inconvenience to begin teaching your dog the core “nervous system” skill of recovering. If you’re using crate training to house break your puppy you might want to check out our article on House Breaking 101.